All students and scholars are curious about the human faces behind the impersonal rhetoric of academic disciplines. 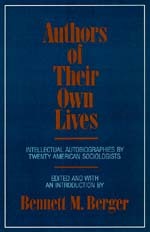 Here twenty of America's most prominent sociologists recount the intellectual and biographical events that shaped their careers. Family history, ethnicity, fear, private animosities, extraordinary determination, and sometimes plain good fortune are among the many forces that combine to mold the individual talents presented in Authors of Their Own Lives. With contributions from women and men, young and old, native-born Americans and immigrants, quantitative scholars and qualitative ones, this book provides a fascinating source for students and professional sociologists alike. Some of the autobiographies maintain their reserve, others are profoundly revealing. Their subjects range from childhood, educational, and intellectual influences, to academic careerism and burnout, to the history of American sociology. Authors stands alone as a deeply personal autobiographical account of contemporary sociology. Bennett M. Berger is Professor of Sociology at the University of California, San Diego.